How to preserve shape of meatballs and mince-meat shami kebabs? What ingredients help these items keep their shape? We tried chicpea flour, eggs but the bodies do not keep their shape but some chefs make it so solid that you can literally throw it to someone to catch and it will not loose its shape? Overworking the meat is generally what you want to avoid for a burger, but in the case of kebab meat it may help. It will give it a denser and bouncier texture. To do this, when mixing in the other ingredients, just mix for a bit longer than you normally would, especially with your hands as the heat will probably melt the fat slightly and help to bind it. Keep working it until the texture is smooth. For meatballs, you can take 1/2 to 1/3 of the meat and process it in a food processor to make it almost gluey. Mix this with the flavourings/herbs and process again if you want the meat to homogenized or keep the herbs with the unprocessed part if you want chunky herbs. It also gives the meat a springier texture. You can achieve the same effect by working the meat with your hands by mashing and rubbing vigorously as the other answer and comment said. Shami Kababs are traditionally made with boneless beef. The chunkier/thready texture of meat helps the kabab hold their shape. Ground beef mince is also used instead if you like it mild. To achieve a balance, you can use half meat cubes and half ground mince. The trick to a good shami kabab is not just in choosing meat with enough fat to keep it juicy and moist but also in the proportion of chana daal cooked with the mince to hold it together, ideally 1kg meat and 250g daal. More the chana daal, softer the texture will be. It's very important to cook the mixture of meat and daal until all the water has completely and absolutely evaporated out of the mixture before you take it off the heat. If the mixture is too wet, the kebabs will not hold their shape and will disintegrate while frying. Adding an egg in the cooked mixture (of meat, chana daal, spices and herbs) and mixing it in with your hand also helps to retain the shape. You can also place the shaped kababs on a flat tray/platter and put them in the freezer for some time to settle. This will help them hold their shape while frying. If the shami kebab mixture is a bit too sticky or loose and feels difficult to hold together while shaping or frying, as a last resort you can add 1-2 tbsp of roasted gramflour to the mixture but that's not recommended as it interfers with the authentic taste of shami kababs. Dip the shami kabab in whisked egg and shallow fry using minimal oil. This gives them a nice golden crust preventing any disintegration. Kneading salt into the meat should denature some proteins to make it more sticky. This can result in a heavy product, as you have alluded to. То lighten the product it is typical in western cooking to add breadcrumbs, but as these decrease the strength, eggs are often added to compensate. Not the answer you're looking for? Browse other questions tagged kebab or ask your own question. 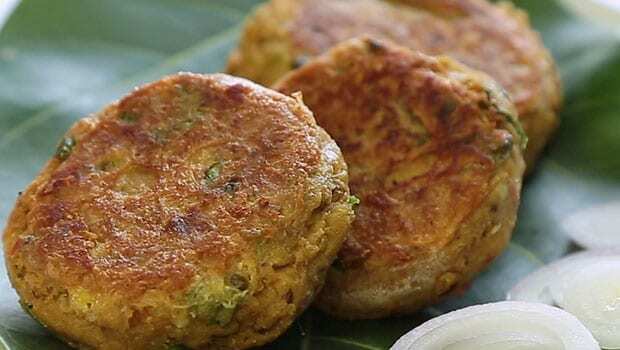 How to prevent shami kabab from breaking at the time of frying them?